August 12, 2018: Casts and creative staff trained in opera don’t always gel with musical theatre material. 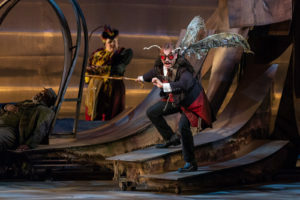 The Glimmerglass Festival in Cooperstown, NY, has sought to combine the two disciplines in its annual offerings since Broadway and opera director Francesca Zambella took over the reigns as artistic director. Under her leadership, of the four mainstage productions, at least one has been a popular musical. 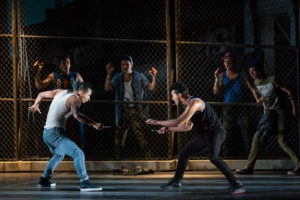 This summer, opera and theater blend almost seamlessly in Zambella’s staging of West Side Story, the landmark updating of Romeo and Juliet which electrified Broadway when it premiered in 1957. Street gangs replaced Shakespeare’s battling Italian noble houses. Jerome Robbins effectively integrated his explosive dance sequences and Arthur Laurents’ snappy book scenes. Leonard Bernstein’s innovative score balanced popular Latin American and jazz elements along with atonal and harmonious chords, expressing the clashing emotions of the characters. A young Stephen Sondheim’s intricate lyrics were sophisticated yet believable as uttered by unsophisticated youths. Even though this is a traditional production retaining Robbins’ original dynamic choreography, faithfully and intensely recreated by Julio Monge, the material retains its relevancy. In Trump’s America, cultural and ethnic divisions are as strong as ever and the violence between the second-generation Italian- and Polish-American Jets and the Puerto Rican Sharks is all too familiar, though their neighborhood on Manhattan’s West Side was razed to make way for Lincoln Center not long after filming was completed for the Oscar winning film version. Peter J. Davison’s flexible and realistic set could be any blighted urban landscape in the past 60 years and Jessica Jahn’s costumes have a hint of hip-hop. 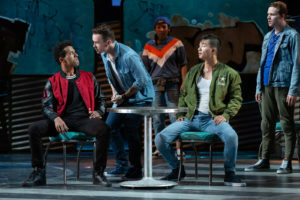 In addition to Zambella’s incisive and fluid staging and the incomparable musicianship of conductor David Charles Abeil and the Glimmerglass orchestra, this West Side Story succeeds because the majority of the cast are the right ages with most coming from the festival’s Young Artists Program. Many’s the West Side revival marred by casting obvious thirtysomethings as teenagers. 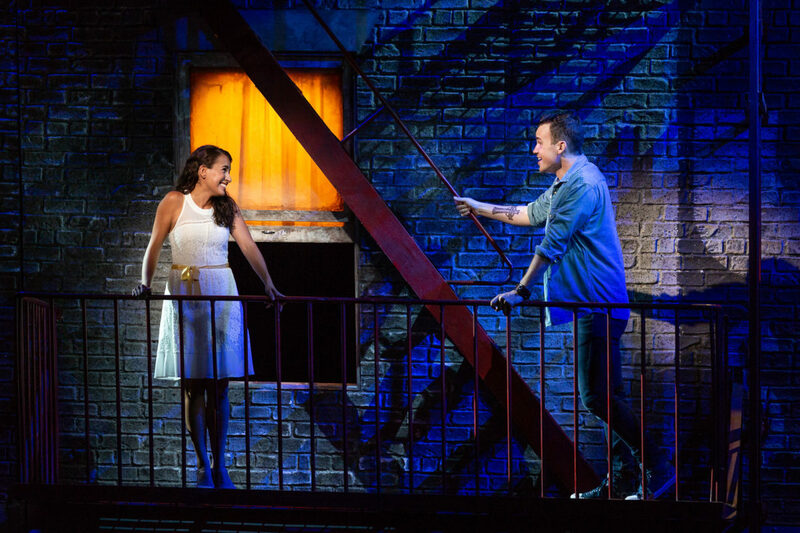 Both Joseph Leppek as Tony and Vanessa Becerra as Maria, the doomed lead lovers from rival gangs, exhibit strong, expressive voices as well as dramatic chops. 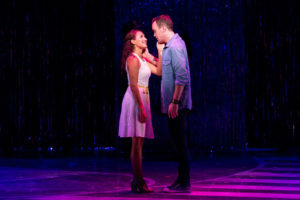 In their solos and duets, they are fully convincing as passionate youngsters falling into the first throes of romance. Amanda Castro sizzles and simmers as Anita, equally effective in the show-stopping “America” and in her mournful, angry number with Maria, “A Boy Like That.” Corey Bourbonniere and Andrew Vu exude energetic rage as the competing gang leaders Bernardo and Riff as do those playing the Jets and Sharks and their girls, creating individual characters rather than anonymous chorus figures. My only quibble is with the liming of the adults which tends to be over-the-top. 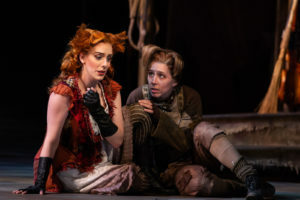 Youthful exuberance also infuses E. Loren Meeker’s sleek and endearing production of Leos Janacek’s 1923 folk opera The Cunning Little Vixen. Like West Side, Vixen features numerous Young Artists as woodland creatures and village inhabitants enacting a tale of the endless cycle of life. Based on a series of Czech newspaper features and drawings, the story blends folk music and lush orchestrations in its depiction of the relationship between a kindly forester and a untamable female fox. Conductor Joseph Colaneri produces a symphonic, massive sound, evoking an entire woodland world full of life. The vixen represents wild, joyous nature. When the forester attempts to capture her as a pet, only tragedy can ensue. The simple travails of the animals in their search for love and shelter is echoed in the behavior of their human counterparts. A covetous badger resembles a grasping, selfish preacher. A marauding wolf is like a avaricious poacher. This duality is cleverly emphasized by Erik Teague’s imaginative costumes which have the animals dressed up like Victorian middle-class townsfolk. 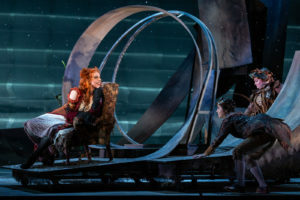 The main thrust of the opera is the connection between the forester and the vixen. Resident Artist Eric Owen and Young Artist Joanna Latini create a moving and mercurial bond. 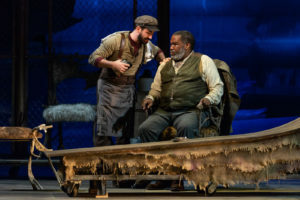 Owens’ rich bass-baritone conveys the Forrester’s love of the natural world and his tender memories of early manhood, both qualities he sees reflected in the vixen’s spunky spirit. Latini’s gorgeous soprano captures that attractive feralness as does her animal-like movement (Eric Sean Fogel created the choreography which replicates nonhuman physicality). As with the Sharks and the Jets, the chorus of Vixen are all individuals with signature characteristics from the strutting rooster to the bustling hens to the bloodthirsty mosquito to the preening screech owl. Each plays their part in this rarely-performed charmer. July 7—Aug. 24. Glimmerglass Festival at the Alice Busch Opera Theatre, 7300 State Highway 80, Cooperstown, NY. Repertory schedule. Running time: 2 hours and 30 mins. including one intermission. $26-$149. 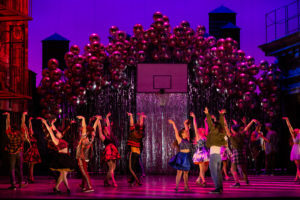 607-547-2255 or www.glimmerglass.org. July 8—Aug. 25. Glimmerglass Festival at the Alice Busch Opera Theatre, 7300 State Highway 80, Cooperstown, NY. Repertory schedule. Running time: 2 hours and 10 mins. including one intermission. $26-$149. 607-547-2255 or www.glimmerglass.org.